Last Saturday's show at the Metro was an intense combination of two especially good tours: mellow, west-coasty Best Coast and opener Male Bonding, and high-octane Titus Andronicus and opener Free Energy. Male Bonding started the evening with an energetic set of west-coasty, grunge- and punk-influenced poppy rock that was as much fun to watch as to hear live. Singer/bassist Kevin Hendrick danced around his corner of the stage with a wiggly shuffle, drummer Robin Silas Christian seemed to put his whole being into every single hit as he laid down the beat, and singer/guitarist John Arthur Webb acted a bit like an anchor for the other two, primarily standing still while singing and playing, but with contained energy. They played loud, and they played fast. And it was fun. I'll admit, I wasn't that impressed with Free Energy when I saw them play in town about a year ago. Their sound is still super-70s pop/rock (complete with plenty of cowbell and meedly guitar figurations) and still feels just a little too derivative for me, but wow, this time around, their live show absolutely shone. They have stage presence to spare and filled the Metro's stage with their energetic performance (that, this time around, felt a lot more genuine). Maybe it was that, as singer Paul Sprangers said, "This feels like a big show." Whatever the reason, Free Energy really impressed me this time around, putting on a great live show that I would see again. When I saw Best Coast play at this year's Pitchfork Music Festival, I remember being surprised at how packed their audience was for so early in the day. Their sound was just okay that day, but in the closed space of the Metro, Bethany Cosentino's mellow, haunting-but-soothing vocals filled the room with good vibes. She told entertaining stories in between songs, but overall, their show is not much to look at--she just stands there, playing guitar and evoking a 60s girl group vibe with her voice and songwriting. They have a heavy surf influence, and give the listener a sweet feeling of nostalgic isolation. 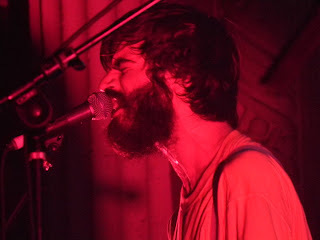 The band I had come to see, however, was Titus Andronicus, and they did not disappoint, churning out tune after infectious, gut-wrenching tune. Like their recordings, their live sound is raw and exuberant and makes you exult in the joy of the moment. They move fluidly from anthemic, sing-along balladeering to pulsing, up-tempo delights in the same song--see, for example, the video of their performance of "No Future, Pt. Three: Escape from No Future" from Saturday's show. They are one of those bands that you don't just listen to, but actually experience, when you see them play live. Highly recommended. Great to see that more fans are experiencing Titus Andronicus live -- they are truly a force to be reckoned with! They killed it at Pitchfork in July and both of their albums are on constant rotation on my playlist. Great review Susan!